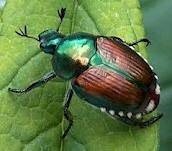 Japanese Beetles have been in the United States for over 100 year. They have slowly made their way from the east coast to the Mid-West. Strict regulations on jap beetle shipping live plant materials from affected to unaffected states has helped control the infestation, however, it was inevitable that they would someday reach our area. The beetle have been in Austin for about 7 years, they now seem to be widespread throughout the town. Preventative treatment for Japanese Beetles in crucial because they have no natural predators. Japanese Beetles have a 6 week mature life cycle. The rest of their life is spent in a immature stage and grubs (which look like white worms). At the mature stage, the beetles eat, mate and lay eggs. Each female beetle lays 50-60 eggs in the ground. These eggs hatch as grubs. They beetle grubs live in the soil, feeding off of roots, generally from grass. Because they spend 10 ½ months in this grub stage it is crucial to treat lawns with a grub control. If turf areas are not treated: 1) the beetle infestation multiplies rapidly; 2) dead brown spots begin to appear in lawns from areas the grubs have consumed almost all the roots of the turf, killing the grass; 3) it is likely moles and voles will infest the area because the grubs are a food source for them. i. Annual grub killer application. This application is done in the same method as a if fertilizing the area with a granular fertilizer. The grub killer is applied through a push lawn spreader. ii. Milky Spore. Milky spore is a live bacteria that lives in the soil. Once applied correctly the application lasts for 10 years. 1. Application option #1: Powder. The Milky Spore powder is applied with the use of a dispenser and applied across the lawn in a 4’ by 4’ grid pattern through the use of a dispenser. One application last for 10 years. 2. Application option #2: Granular. The granular is applied through a push lawn spreader. It needs to be applied a total of 6 time in a two year period. After the 6th application, the are is protected for 10 years. a. Japanese Beetle trap attract the beetles with a pheromone lure. The traps are most effective if they are hung in early June (before the mature beetles are seen). The beetles are attracted to the lure, fly into the bag and cannot fly out. The lure cover an area no bigger and 1/8th of an acre (beetles will not come from the neighborhood to the trap). Most homeowners do not realize how many beetles they have until the traps are hung. CAUTION: DO NOT TRY TO EMPTY BAG TO CONSERVE, REPLACE BAG. a. If beetles seem to be particularly bothersome on certain plants, spraying them with an insecticide may be necessary. The insecticide work very rapidly to kill the beetle, but you have to spray the beetle for it to be effective (the spray has no residual effect).